Exactly one year ago, I moved out of my tiny house on wheels and into a bigger (but still small) house. I call it the little chalet, since it looks like a mini version of a ski chalet or winter cabin. I wrote a bit about it last July, but otherwise, I’ve been generally quiet — or I suppose not as explicit — about what’s going on in my day-to-day life. I used to write pretty openly here, years ago. But things have changed. For a good while, I blamed it on writer’s block. But I’ve thought about this a lot over the past year, and because I work at WordPress.com as an editor and community moderator — a representative of the company among our bloggers and readers — I’ve grown increasingly uncomfortable blogging about me, about my life. And when I do, I have to run a filter over it. Curation, after all these years, is still key. In some ways, then, it feels weird for me to share photos below of my home — my most private space where I live out my life when I’m not at my laptop, typing here. But I’m open to posting new things and seeing how this blog evolves next, and am curious if I can rediscover the joy of blogging, which I felt when I started this site ten years ago. When I could simply post about anything. When my blog was me — all of me, even the parts that were unpolished, that I couldn’t compartmentalize. Now looking at the tidy categories in my menu (under “Blog”), I realize how silly it is that these labels I’ve created over the years have killed my passion and spontaneity. I’ve become a dusty, old cabinet of drawers. This past year, I’ve practiced yoga a whole lot more, I joined a taiko drumming group, and I started gardening. I’ve quickly grown to love these three things, and I noticed that all three help me to be more present in the moment, to just be. I would love to experience this again in the context of blogging or even writing privately: when thought passes from mind to paper, and there is nothing in between. Instead, when it comes to this blog, I feel like a clogged pipe. In the meantime, here are photos of my home and garden, where I love to be as much as possible, and where — for the first time in my life — I’ve truly planted roots. Right now, my favorite thing to do is tending the vegetable beds very early in the morning, before I go to the gym, and before I start to work. It makes me happy and has introduced a whole new layer of wonder and curiosity for the land I’m fortunate to live on, so I thought to share a bit of that joy here. Maybe that’s what this blog needs. The little chalet and vegetable garden. The structure on the left is our well and irrigation shed. The vegetable garden, in between the little chalet and the tiny house. One of the dwarf Japanese maple trees in the front of the little chalet. A “before” shot from last fall, when our contractor began to excavate. He pulled a lot of interesting objects out of the ground, and knocked down a bunch of trees around this oak, which I now hope will thrive. An “after” shot, not quite from the same angle, but you get the idea. 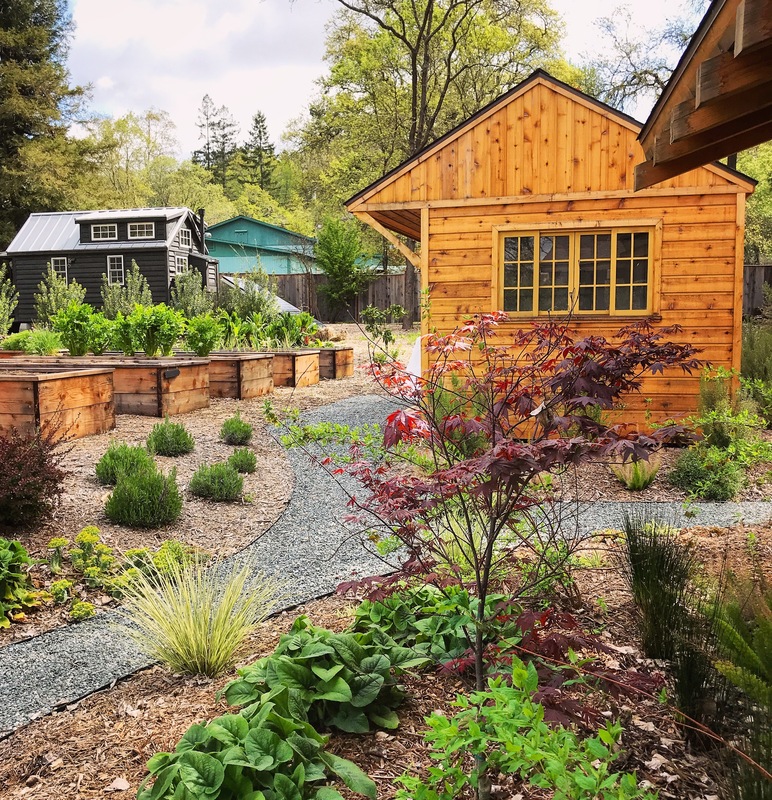 The large, leveled area to the left of the tiny house became the location for the raised beds. This corner bed is primarily for strawberries. A natural, non-manicured landscape with primarily native and drought-tolerant plants. The first winter spent in this house was full of extraordinarily heavy rain — the most powerful storm systems California has seen in years. Despite having a lot of flooding and drainage issues, we were able to observe where and how water was flowing on our lot before we started construction. Our landscaper created a French drain system and a meandering dry creekbed, which will direct water toward the corner of the lot, where it’ll join a river that forms during storms. An in-progress shot (some spots still need mulch) with a peek at my little redwood grove in the background. The bare patch on the left is for a shed, which will be installed soon. This particular bed has bush beans, marigolds, and zinnias. Crossing my fingers that everything grows! One of the seedlings in the pepper bed: King of the North. A Meyer lemon tree near the tiny house. The area behind the tiny house is mulched and bare — there’s certainly more space to build. I’m still not sure what to do with the tiny house — a space for guests? a long-term rental? an Airbnb? But for now, he’s got a pad and driveway all to himself. The tiny house and a grapefruit tree (on the right). The purple plants — catmint — surround the entire vegetable garden. Doors to my bedroom, which lead onto the main deck. Great for yoga and post-gym stretching, especially in the morning. I stumbled upon this via twitter. I have an account but do not use it. Do not do any social media, but when I saw your name I had immediate fond memories of the work you did with my students. Your home and garden are stunning! Your photos from your travels are vibrant and so inviting. So happy to see all is well with you. Wishing you continued success. I was pretty honest—there were ultimately more disadvantages than advantages. It was the right transition for me and my husband for sure, but turned out to be a temporary step. It’s hard to address your response without specific questions, so feel free to ask more if you’d like if anything in those posts resonate with you. All the best in your relocation and journey—sounds exciting! Congratulations on all your hard work, your garden looks amazing. It will be interesting to see a follow up post in the next couple of years and see how your garden has thrived. I look forward to it. Keep up the great work! Lee. You have such a lovely home and garden, congrats! I’m absolutely craving a small home of our own with, most importantly, some land where we can grow our own food. Love that observance of nature where you can take the time to figure out what would thrive in the environment and how to make the best of the conditions i.e your water flow. Lemon trees are top of my list!!! A Meyer lemon tree and firs. You have to live in a mixed subtropical climate. Interesting to read how you link yoga, music, and gardening to your desire to just “Be.” I’m sure that many other bloggers understand and share your dilemma about finding balance between what should or not be shared. It was fascinating to follow your journey as you built your tiny house. The chalet is gorgeous and your garden set in the raised beds is really gorgeous. Yes, it looks like you planted seeds and are now establishing roots. And the result is blooming. I wish you and your husband the best in this lovely place. Wow! What an amazing home you’ve created and cultivated. Inspiring! Thanks for sharing. Your home looks so serene and perfect. Thanks for sharing. Your home looks so beautiful, and I really enjoyed reading this blog post and hope you will find all the enjoyment again. Ooh my this is beautiful. Wow, it looks so serene as if it’s straight from a fairy tale. Ces photos me donnent des idées pour l’utilisation des sols de manière rentable. Je vais les sauvegarder attendant de m’en inspirer en temps opportun. Je le ferai dans le cadre d’un projet d’éducation et de développement économique et agricole au Burkina Faso (Afrique de l’Ouest). Ces photos démontrent que les hommes ont beaucoup de savoir-faire, beaucoup d’ingéniosité pour créer de belles choses à la fois pratiques et esthétiques. Oh Cheri, I love this post! How beautiful and sacred your home is (and I love your morning routine of the vegetable garden and gym). Thanks for sharing something personal. Your place looks very peaceful. I hope you don’t have any crazy neighbors. Love the garden. Nope, no crazy neighbors. Sometimes noisy with their lawnmowers and machinery and roosters and whatnot, but all of them are pretty friendly and chill. Very cool that you are planting native plants, and gardening. Sometimes I think about how we’re these animals that survived for 70,000 years as hunters and gathers and it is just not in our DNA to be these totally computerized, industrial creatures. Getting back to things like gardening just seems like it would be naturally good for our health. By the way, I love your line, “I’ve become a dusty, old cabinet of drawers.” Somehow turning the monotony into poetry just makes everything better. What a cool place! Enjoy its blessings . . . Thanks for sharing your journey with us. The house and garden look like a little piece of heaven. Wishing you well and every happiness as the roots continue to grow and bear beautiful fruit for you. Warm wishes. Cheri, I for one have enjoyed your post, both your sincere words and excellent quality pictures because now I see you as a real person with real concerns rather than just a face and name behind a platform for sharing other interesting posts. Relax into your beautiful space and what to write (and share or not) will take care of itself! Thanks so much — I’m becoming more conscious about this online space becoming too sterile and heavily curated. I think filtering ourselves to a point is totally fine, but you stated exactly what I hope to avoid — being just an avatar and username on a platform. Hi Cheri, I think evelyneholingue summed up what’s happening to you in her comment on your link “wrote a bit about it last july”. You are changing, growing, realising that what you value now is different from before and for my generation that’s fine, we can adjust easily because we don’t feel accountable to anybody. We didn’t leave a blog/paper trail. Only our nearest and dearest knows or remembers our past, our old values, how we were. For your generation there seems to be a belief that you must display everything about your life on a daily basis! This might make changing more difficult? You are still unsure…”In some ways, then, it feels weird for me to share photos below of my home”. …look at what you love now…. “This past year, I’ve practiced yoga…a taiko drumming group… gardening… grown to love these three things”. Write and share what you love and want to share, don’t feel you have to share anything you don’t feel comfortable sharing. You’ve got loads to share but I’d say sharing the bits you love won’t make you “feel like a clogged pipe”. Have fun finding the present you, let go the 10 years ago you!! I think you have created a little paradise for yourselves. The place looks amazing – I’ve been going through the same existential crisis RE: blogging and living more in the now, spending time in the garden and doing up the house…. though living in a mountaintop rainforest everything grows like mad – and there is a lot of little critters to eat what you grow before it gets ready to harvest. So now any edible gardening is going to have to wait until I build a greenhouse 😦 I also live in a cottage (French style) in-between the size of your tiny house and the chalet, and love to do my stretches in the morning under the canopy to the tropical birdsong. I love living in the now, but always wish I was writing more. Your home sounds so lovely — and full of life (critters and all!). This post really resonates. I started working in journalism and left blogging and I think part of it was a sense of discomfort and a feeling I needed to censor myself on some level and the thoughts I put down publicly. I only recently left a very negative work environment and have thrown myself back into what I consider ‘real’ non-stifled creativity along with gardening (which I find really therapeutic). There is such great satisfaction in growing your own food and actively creating one’s own environment and I hope it will lead me to greater peace of mind and down an alternate road where where I can express myself without boundaries (real or imagined). Thank you for continuing to share. You’ve created something beautiful and there’s much to be admired. Bravo! Really love your thought about finding an outlet — like gardening and growing your own food — that lets you “express yourself without boundaries.” Blogging and writing online, whether in posts or social media updates, has planted this seed in my head (forgive the pun) that whatever you create must have an audience, must go out into the world. In the garden, I love the feeling of nurturing and building something with my hands in the soil — such a new way of creating for me, as I’m very much a beginning gardener. Thanks for your comment. Love your new place! We’ve lived in ours for 17 years and plan to relandscape. It needs a perky facelift. I love love love your property, seriously #goals! I live on Little Chalet Farm, a half-acre in West Sonoma County, California.